When it comes to dens of iniquity, few are as fab as Lucifer's Lux. The L.A. hotspot (which has actually been a reproduction of a real Hollywood nightclub on a Vancouver soundstage for the past two seasons) has been home to crimes of both the passion and penal variety, illicit hookups, musical numbers and all sorts of glitzy bumping and grinding. So basically, it's heaven on Earth for our favorite fallen angel (Tom Ellis) and his celestial squad. Tom Ellis gives us the scoop on what to expect in the show's Season 2 finale. 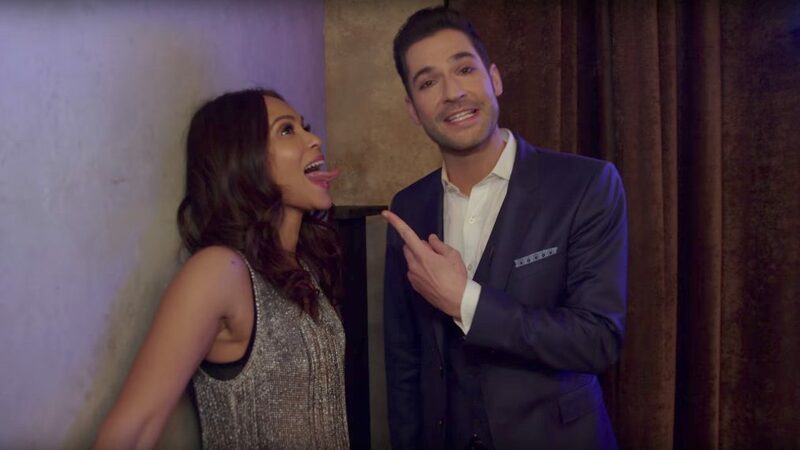 In this exclusive video, Ellis and his equally impure thought-inspiring costar Lesley-Ann Brandt, who plays Mazikeen, offer a behind-the-scenes tour of the joint during their downtime on set, explaining which parts are functional (that piano) and entirely fake (hey, Mr. Deejay). It's enough to make you wish you lived closer to California...if only to hear South African-born Brandt use her real accent. And to throw back some whiskey with the two of them, of course!